Wat Pa Lelai Worawihan (often called Wat Pa Lelai) is a temple in Suphanburi Province, located on the west side of Suphanburi River, Malai Man Street, which is in the Mueang Suphanburi District of Tambon Rua Yai. The local population refers to it as "Wat Pa", which means Temple of Forest. This temple has a holy main Buddha image named "Luangpho Toh" in sitting posture with legs down. People popularly visit Wat Pa Lelai to pay respect to Luangpho Toh. Wat Pa Lelai, famous temple in Suphanburi province launched the first version of Khun Paen Saneha Naa Thong in Thailand beautifully designed and rich power of protection, charm and wealth. 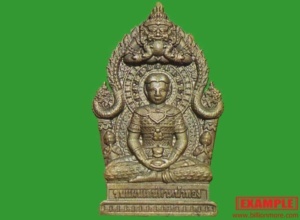 Khun Paen is the legend of Suphanburi province. It says Khun Paen is a very skilled warrior and also a great lover who has many wives. 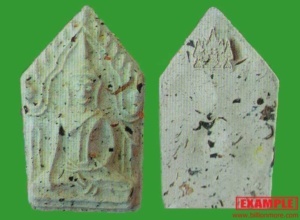 To find material to make this Khun Paen, Wat Pa Lelai and team traveled to many places relevant to Khun Paen around Thailand such as the soil from Mae Thongphrasi House in Kanchanaburi Province (Khun Paen's mother house), old brick from Khun Paen Temple, old brick from Wat Pa Lelai, joss stick ash from Phraya Shrine in Kanchanaburi Province, the brick from Somyai old temple in Kanchanaburi Province, the mass from Nong Buaklee Cave in Kanchanaburi Province, the mass from the old temple where Khun Paen did the roasted infant ceremony and the mass from other places where cannot be explained. Many kinds of herbs and plants, the holy powder and the mystic symbols from instructors are also used. Not only, there are more than 500 kinds of holy mass from 6 countries India, China, Cambodia, Laos, Myanmar and Thailand. Moreover, it is mixed with ashes of Suer Bai who once was a good robber. Family of Suer Bai is glad to be part of this project. Son of Suer Bai said his father was a good man, so this amulet could help and protect the owners. Suer Bai or Mr. Bai was born in 2464 B.E. (1921 C.E.) in Suphanburi province. At first, he was a common man working as a farmer. One day, robbers invaded and took away his buffalo and sister-in-law. He followed robbers to revenge and became a robber after that. In 2487 B.E. (1944 C.E. ), Suer Bai became famous as an uncommon robber because police could not catch him easily. People believed he had magic to protect himself like his friend Sueadum who now is a guru monk well-known as Luangpho Thaweesak, Wat SrinuanThammaWimon in Bangkok. Suer Bai was a good robber like Robin Hood because he robbed only greedy rich men and took money to help the poor. When he robbed, he got partial money not full, was polite and did not hurt his victims. At last, he was arrested by Khun Phantharakratchadet. Court gave him life sentence but due to his confess, he got life imprisonment. Later, his years in jail went down to 20 years. Suer Bai had a family and always taught his children to be a good man, love the king and nation. Suer Bai died on 27 May 2015 at the age of 94. Ceremony: This Batch was blessed in official ceremony at Wat Pa Lelai, Suphanburi province on Thursday 30 July 2015 (holy Buddhist day). Several Thai celebrities came to the temple for Khun Paen amulet. 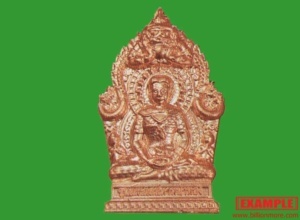 casting wonderful ore "That Kaiyasit"
Power: Phra Khun Paen is a famous pentagonal Buddha amulet in Thailand. Phra Khun Paen is powerful in charm, wealth and protection. Thai people believe with Phra Khun Paen, owner will get protected, be liked by people and become wealthy especially involving commerce. To find material to make this Khun Paen, Wat Pa Lelai and team traveled many places relevant to Khun Paen around Thailand. Not only, there are more than 500 kinds of holy mass from 6 countries India, China, Cambodia, Laos, Myanmar and Thailand. Description: A nice bell key ring which was already blessed by monk. It will make you lucky in finance. Power: Gurus say Bia Gae or Cowrie Shell has mysterious power in itself even without any blessing. Thai people believe it can carry off black magic, spirits and other bad invisible things from their life. "Phaya Tor Ngoen Tor Thong" means "bringing money and gold". "Namrerk" amulet is molded in the ceremony. "Wahn Maha Saney" means "charm plant". "Lord Chong" means "color of green and white". "Saney Nang Kwak" means "charming goddess of commerce". Power: This is "Khun Chang" a main character in the same literature as Khun Paen. Khun Chang is said to be very rich and loyal to Nang Pim, lover of Khun Paen. As a result of that, having Khun Chang Image at home is an auspicious sign of coming wealth and successful business. Phra Sangkajjai is an enlightened disciple of Buddha. At first, Phra Sangkajjai was good-looking and clever. He looked so good that people called him Buddha. Phra Sangkajjai was not feel good to hear that because Buddha was the highest person in his thought and he did not want to be compared with Buddha. So, he transformed himself into a chubby monk. However, people still admired him as usual. Since then, a fat monk has become the image of Phra Sangkajjai. 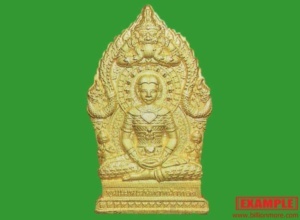 **Belief: Due to a plenty image of Phra Sangkajjai, worshiping him is believed to bring wealth. 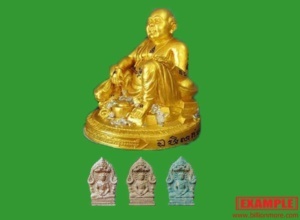 Furthermore, his previous good appearance and best wits become the belief that whoever worships Phra Sangkajjai will be a favorite of people and successful in all science. Present: Backside with gem and gold fish and silver fish to bring good trade. Don't miss out! Created only 500 pieces. Present: Backside with gem and Luangpho Toh Buddha Medal of Wat Pa Lelai to bring safety, good luck and good things. Present: Backside with gem star and Billionaire Guman Thong amulet to increase wealth. Present: Backside with gem star and tiny Phra Khun Paen amulet to increase the power. Present: Backside with gem and Phra Khun Paen amulet to increase the power. Present: Backside with gem and Garuda Amulet, a symbol of authority and for protection from dangers and evil forces. FYI: Wahn Kai Daeng is a well-known charm plant with a brightly red flower popularly used as material for amulets. Power: High charm of this wax will facilitate the way you speak, do business and career. If looking for talisman for personal attractiveness, wealth and successful negotiation, here is obvious choice. Ceremony: The abbot of Wat Pa Lelai Worawihan properly blessed this amulet in the auspicious time. 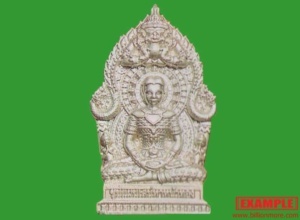 Power: Gurus say the best Phra Ngob Nam Aoi amulet is in Suphanburi province. Phra Ngob Nam Aoi, a circle amulet has superb power that makes person invincible. 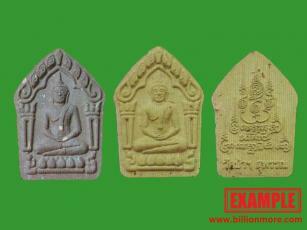 Power: Phra Mahesuan is ancient amulet of Thailand and one of Benja Phaki, top five famous ancient Thai amulets. Phra Mahesuan is believed powerful in all sides; protection, charisma and wealth. 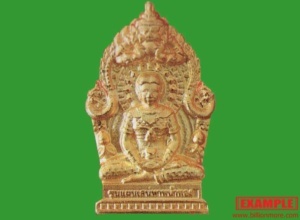 The first Phra Mahesuan in history was found in the chamber at Wat PhraSriRattanaMahathat, Suphanburi province. Singnature of Phra Mahesuan is the upside down Buddha on backside. Power: Phra Rod (Buddha of Protection) is an ancient amulet in Thailand which can help the worshiper safe and invulnerable. after sent payment by 3 business days. Payment must be sent after do transaction by 3 days. "I just received my khun paen and oil. Could you send me katha? :))) Thank you so much for everything! I appreciate it very much! "